A great barbecue taste that’s made right in the kitchen. These BLACK PEPPER and MOLASSES PULLED CHICKEN SANDWICHES have an undeniable smoky and sweetness taste you are going to love. Make them soon! These Black Pepper and Molasses Pulled Chicken Sandwiches are about the easiest weeknight dinner you could possibly throw together. Good taste and simplicity is what we need Monday through Friday and this meal fits into those parameters quite nicely. I thought I was being clever and doubling this recipe, because who doesn’t need leftovers, however, my guys ate all of it in one sitting. They loved the flavors. The sauce has a great barbecue taste. The chili powder and cumin add a nice smokiness, while the ketchup and molasses add the sweetness. The perfect side dish for this recipe is coleslaw and this Tennessee-Mustard Style Coleslaw goes together perfectly with this dish. However, The Best Homemade Sweet Potato Chips are also amazing when served with these sandwiches. As you can see, the color of this sauce is outstanding and it tastes as good as it looks. Make it in your favorite saucepan. The chicken cooks right in the sauce, which is such a time saver. Make sure your chicken is cut up into perfect bite-sized pieces. This sandwich has always been destined to be served with a knife and fork. I mean, unless you place it nicely on the bun and it fits perfectly into the bun. I prefer to serve this a little messy and scoop up a bite with coleslaw and chips to make sure I get every last bit of sauce. My kids ask for this dish time and time again. It’s one of their absolute favorites. I can’t wait for you to try these, they have been a family favorite for years! 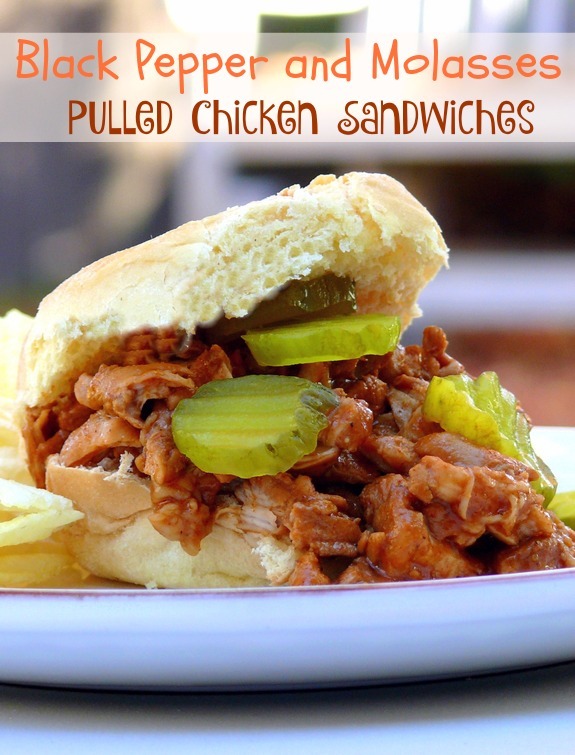 Chicken sandwiches are always a great quick and easy meal and here are some others you might enjoy. These Cheesy French Onion Chicken Sandwiches sound amazing. And who wouldn’t want to take The Ultimate Chicken-Chicken Salad Sandwiches on a picnic? These Hawaiian Chicken Sandwiches could be my next favorite. Open Faced Thai Chicken Sandwiches are one of my absolute favorite sandwiches on the planet. And this Apple Butter BBQ Chicken Sandwich is on my menu next week. FYI: Please join our NOBLE PIG FACEBOOK GROUP for a more in depth look at recipes, cooking tips and other member contributions. Combine first nine ingredients in a medium saucepan; bring to a boil. 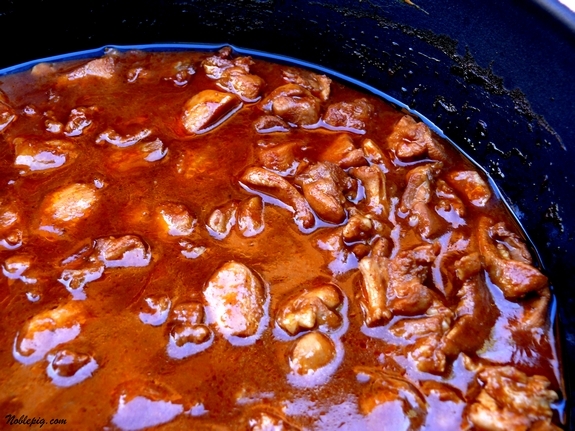 Reduce heat to medium-low; cover and cook, stirring occasionally, 23 minutes or until chicken is done and tender. Remove from heat; shred with 2 forks. Place 1/2 cup chicken on bottom half of each roll. Top with pickles and top half of roll. *Note: I doubled this recipe in the hopes of having leftovers but it was eaten up in one meal, go figure. However, it does double or triple nicely if that meets your needs! Oh yum, looks fabulous. Don’t you love when your guys deprive you of tomorrow’s lunch? I think that’s the ultimate compliment. Uhhhh…yummy! I am so going to make this! Love the easy weeknight BBQ. This recipe is so easy I must try it With three teenagers I’m definitely doubling it – or maybe tripling it! Wow, that looks absolutely delicious. The spices, mustard and molasses sounds like a great flavor combination. Now this is my kind of meal!! Awesome! These look absolutely mouthwatering, what a treat these would be any day of the week. Very simple and tasty! I agree that we need something simple during the holidays, and this fits the bill perfectly. It would serve as an alternative to BLT’s that have on some evenings, simply because it is a quick and easy meal. Thanks for this one! Hmm…I think I have almost everything I need to make this. I’m sure we’d prefer it with chips too. Delicious as ever…and beautiful colours. Easy & attractive too Cathy! Love the potato chips on the side…nom nom nom nom nom! Oh yummy! Guess you will need to triple it next time so you can have a little left over, huh? Easy AND delicious? Right up my alley…plus the whole molasses helps with your iron scenario cinches it. I’m with Lydia on this one…going to toss it into my crock pot and forget about it for a while. I can almost smell it cooking! Thanks so much for your blog and sharing your amazing recipes! Oh man, this does look good. If I had seen this earlier it would have been our dinner!I will be making this. This photo leaves me wanting more Cathy. You have been bringing so many recipes that I just love and my family loves too. I enjoy coming here everyday and enjoying myself. Thank you. iâ€™ll be the first person to jump at a pulled chicken sandwich, and that sauce is SO ridiculously appealing to me. i donâ€™t like molasses in gingerbread, but iâ€™ll take it any day in a)cookies or b)marinades. good stuff! 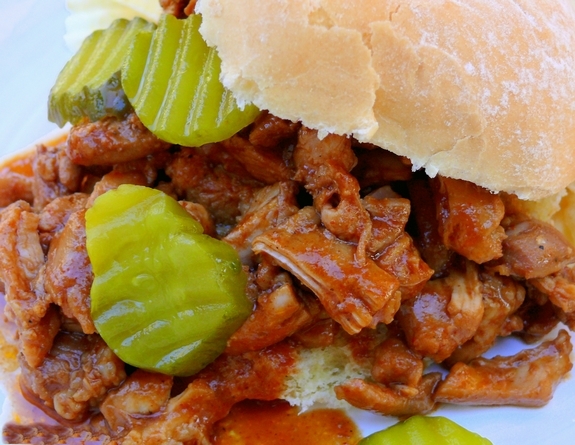 Pulled chicken sounds wonderful prepared with molasses! I love pulled pork, and this sounds like a winner, too! I’m always up for a good sandwich. I’m going with the crock pot idea. This sauce looks awesome. Oh my! Doesn’t that look perfect? Oh my that looks good! Now I am hungry! supper. 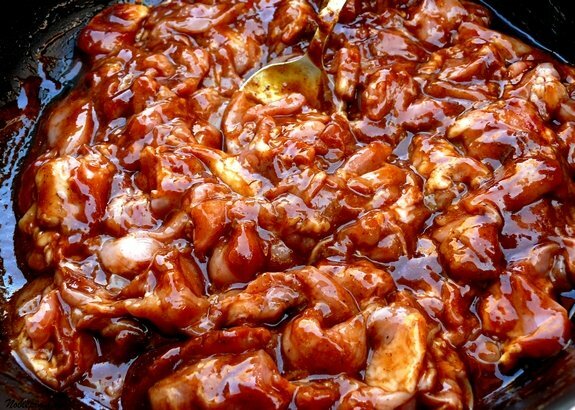 The sauce really sounds good and the molasses adds a depth of flavor usually missing from the easier barbecue sauces. You’ve made me hungry. Hopefully, second time around will be a charm. Just wanted to let you know your sandwiches look delicious. Oddly enough, I was just thinking about making a pulled pork or chicken dish soon. Now I have a new recipe to try out. This looks easy and delicious which always works well for me. This is right up my alley & Mr. Snoots will love it! oh wow, this looks amazing! i don’t think anyone can resist thi! I just finished this recipe and it was pretty yummy. 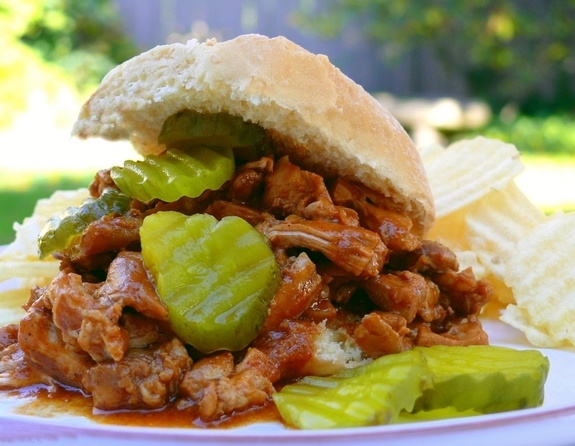 Ridiculously easy to make, simulates pulled pork with much fewer calories. My only criticism is that the sauce is a bit lacking in the “kick/bite” department. Perhaps a bit of cayenne or red pepper would remedy this. Yes, cayenne would be a nice addition. I didn’t use it because I was serving it to my children as well. I love this sandwich! Great idea for a nice casual Friday night supper. I’m marking this one. I think a little hot sauce drizzled in here would be nice too. I can’t wait to try this! If it’s easy and the family loves it, I’m in!! I made this one, too. It was really good and I really enjoyed the flavor of the sauce. Definitely a repeater. The chips are a nice idea, too! made this for dinner tonight and it was great, with a litle bit of extra chilli (and I think some of the chilli from my mango slaw seeping through as well) it had just the right amount of kick to it. The other flavours come together really well in this recipe. You have some interesting recipes on your website. I made these last night and they were delicious! I made these tonight (and did the chicken in the pressure cooker) and they were amazingly tender and delicious. Thanks so much for the recipe! Cars and houses are expensive and not everybody is able to buy it. However, mortgage loans was created to aid different people in such hard situations. I would make this but use chicken breast instead. I cannot stand thighs and anymore around here ( Springfield Ohio) they are close to the same price.